Hmm, let me do a quick search for "Doctor 3D glasses". 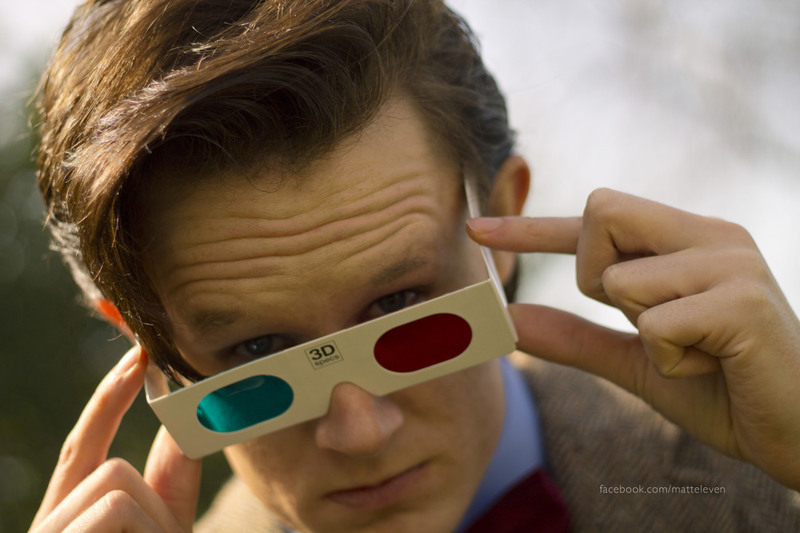 Oh look at the images found of a certain Doctor wearing 3D glasses. Look at all the merch featuring that Doctor in 3D glasses. I have to agree with Master of Spiders that this question is too vague. It needs to be rephrased so that we know what incident the asker has in mind. "Doomsday" does seem by far the most likely but it's only the asker who really knows the incident he/she has in mind, so it's for him/her to specify that -- or to specify another incident, if we happen to be wrong in thinking the question's about "Doomsday". It is possible to be too picky but, on the other hand, we have the problem that we cover TV, audios, novels, comics &c, &c over a period of 50 years, which is a huge field. A while ago, we had a question about the Doctor & a toothbrush that seemed to be asking about "The Lodger" (in which the Doctor mistakes an electric toothbrush for his sonic screwdriver) but it turned out -- when eventually clarified -- that it had nothing whatever to do with that episode. Instead, it was asking about a comic story from decades ago -- a story almost none of us remembered at all & nobody (except the asker) remembered had involved the Doctor with a toothbrush. I don't recall the details of the question but I do recall that it took substantial effort & a prolonged discussion on the talk page to establish what the question was really asking about. I know I was involved in that discussion & I'm fairly sure Master of Spiders was, too. I can well understand the reasons for using a bot to cut down the number of outstanding CFDs but the problem there is that a bot can't exercise judgement, as a person can. Ideally, the bot would skip questions tagged for being vague. That, however, would require it to have some way of identifying such questions & it's difficult to see how it could do this. When I tag a question for that reason, I include the link [[Doctor Who Answers:Policies#Vague/Can Change Meaning Over Time]] in the reason. Others use [[DWA:VAGUE]]. Unfortunately, a substantial proportion of questions tagged for being vague are tagged without any link to the policy & often with a one-word deletion reason, such as "unclear". That seems to me to be sheer laziness on the part of the user who has tagged the question & it doesn't give a bot any reliable way to identify such questions. Even if we devised a "marker" to identify questions tagged for being vague (& a link to the policy is the obvious marker to use), we'd have no way of ensuring that it would always be included in the tag.